FRIDAY, Dec. 30, 2016 (HealthDay News) -- Urinary incontinence is a widespread complaint among women, but a new study suggests that older women may find relief from this frustrating problem if they're slimmer and stronger. The study followed nearly 1,500 women in their 70s for three years. Researchers found that a decrease in body mass index of 5 percent or more during that time led to a 50 percent reduction in the risk of new or persistent stress urinary incontinence. Body mass index (BMI) is a rough estimate of a person's body fat based on height and weight. For example, a woman who's 5 feet 6 inches tall who weighs 175 pounds has a BMI of 28.2. If she lost 5 percent of her BMI, it would be 26.8, which translates to a weight loss of about 9 pounds. The study also showed that a decrease in grip strength of 5 percent or more was linked to 60 percent higher odds of new or persistent stress urinary incontinence. Grip strength is considered an indicator of overall muscle strength, the study authors said. "Our study found that changes in body composition and grip strength are associated with changes in stress urinary incontinence frequency over time, but not with changes in urgency urinary incontinence frequency over time," said the study's lead author Dr. Anne Suskind. She's an assistant professor of urology at the University of California, San Francisco. Suskind said that distinguishing between the two types of urinary incontinence is important. "Stress incontinence is involuntary leakage of urine associated with an increase in abdominal pressure (i.e., coughing, laughing, sneezing)," she explained. "Urgency urinary incontinence is involuntary leakage of urine accompanied or immediately preceded by a sense of urgency. The underlying mechanisms of each type of incontinence differ and each type of incontinence is treated differently," Suskind said. Stress urinary incontinence tends to happen after delivering children, said Dr. Megan Schimpf. She's chair of the Public Education Committee for the American Urogynecologic Society. Urgency incontinence may be caused by neurological issues, Schimpf said. At the start of the study, there were 1,475 women aged 70 to 79. Of those, 212 women said they had at least monthly stress urinary incontinence, and 233 said they had at least monthly urgency urinary incontinence. Women who said they had at least monthly urinary incontinence had an average BMI of about 28. It was slightly lower -- 27.5 -- for women who didn't have incontinence. A BMI between 24.9 and 29.9 is considered overweight. A BMI above 30 is considered obese. After three years of follow-up, 1,137 women were still in the study. Of those women, 164 women said they had new or persistent stress urinary incontinence, and 320 had new or persistent urgency urinary incontinence. The study authors suggested that losing weight -- even for a woman in her 70s -- may help stress urinary incontinence by relieving some of the pressure on the bladder. Likewise, grip strength may indicate overall strength, and stronger bladder muscles may be able to withstand more pressure. Neither of these factors was linked to an improvement in urgency urinary incontinence. This may be because urgency urinary incontinence could be the result of years of damage that isn't so easily reversible, the researchers noted. Schimpf said whatever the cause, women of all ages with urinary incontinence should see their doctor. "A lot of women are unfortunately under the assumption that incontinence issues are normal, and that's definitely not the case," Schimpf said. There are a number of treatments for stress incontinence -- from pelvic floor physical therapy to silicone devices called pessaries, to surgery -- and these treatments aren't one-size-fits-all, she added. Schimpf said caffeine, alcohol, nicotine and artificially sweetened beverages can irritate the bladder and trigger bladder spasms, which can lead to overactive bladder symptoms. Circling back to the new study's findings, researcher Suskind pointed out that weight loss and increased strength can also be effective treatments. "Appropriate diet and exercise would be a good place to start, and may be helpful in decreasing the odds of new or worsening stress type of urinary incontinence," she said. 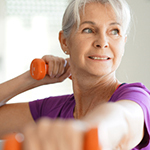 The study was published recently in the Journal of the American Geriatrics Society.